...While Collins fills his mixed-media frames with words, images, and signs, Dan Addington expresses more by saying less. Addington's paintings on wood covered with acrylic and beeswax are eerily empty except for the vestiges of stylized, often embedded or embossed forms; these forms are usually in the shapes of arabesques, shamrocks, and flowers. Dominating the surface is a symbol - such as a cross or a lily - painted in roofing tar. Against the beeswax surface, this roofing tar is stunningly evocative: Stroked with a brush, the tar, a noncolor, seems visceral. Because Addington is working with primitive imagery, the materials pick up the associations of the primal. The smaller paintings are especially compelling. With titles that hint at narratives (The Lost One, The Marriage of Damage and Loss) or invoke Roman Catholic symbolism (Chalice, Distant Garden, Thorn Shadow), Addington's paintings posit suffering as a way of knowledge or a rite of initiation. 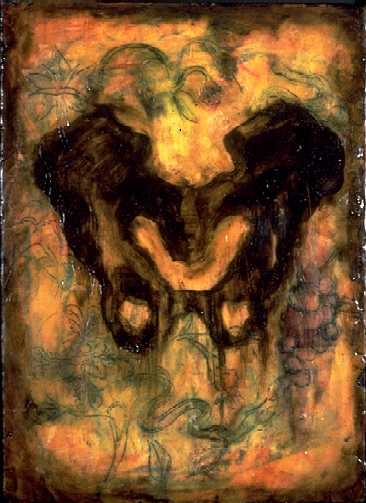 Locus shows the form of a pelvis, painted in tar, superimposed on a densely painted, luminous surface through which one sees flames, grapes, a snake; the locus/place/origin is thus invoked as the Garden of Eden without being explained or brought up to date. Similarly, Healer's Journal is a caduceus whose intertwined form has the visual resonance of a figure; Bed of Temptation shows a stylized rose in black tar as if to echo Blake's plaint to love: "O Rose, thou art sick." These images, especially the beautiful Black Cross, have the intensity of horrific, atavistic dreams. The landscape of these paintings is Celtic - primal, ruined, with brushfires that won't go out and dead bodies that no one will bury. Malton Gallery staged a wonderful inauguration to the season with this show. Both artists address the inscrutable and take as their subject the mysterious. Collin's work is immediately appealing, but so self-possessed that it seems cold. In contrast is Addington who, on the surface, seems to be trodding overtilled ground; one would think these symbols, deprived of historical context, had lost their power. But Addington's paintings truly surprise: they remind us that necessity - as opposed to attitude or will - can compel the making of art. The result is stirring and memorable - like images that come unbidden when we close our eyes. Maureen Bloomfield is the Cincinnati corresponding editor for Dialogue and a recent recipient of an Ohio Arts Council grant in poetry. 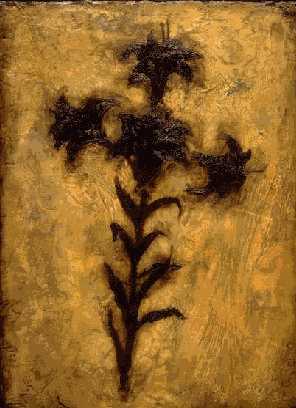 Pictured above: Dan Addington, "Black Lily", oil, wax, tar on wood, 14 x 10 in.